AEJ and I have been in Japan since Thursday (Japan time — which is Wednesday-ish in America), and a whole lot has happened. Kind of an amazing amount, considering how long we’ve been here. And every minute has been incredible. I’ll write a lot more over the next few weeks — it’s going to take at least that long to get these blog entries out — but I wanted to write a short one tonight, just about tonight, because this was a special evening that I’ll remember for a long, long time. Tonight, AEJ and I were dinner guests of Mr. Kohtai Yoh, one of the consortium members of my new piece, “Kingfishers Catch Fire.” (The work premiered here in Japan on Saturday — that’s why we’re here — but more on that another time.) Yoh-san conducted a wonderful performance of “Redline Tango” with the Kannonji Daiichi High School band — also on Saturday. 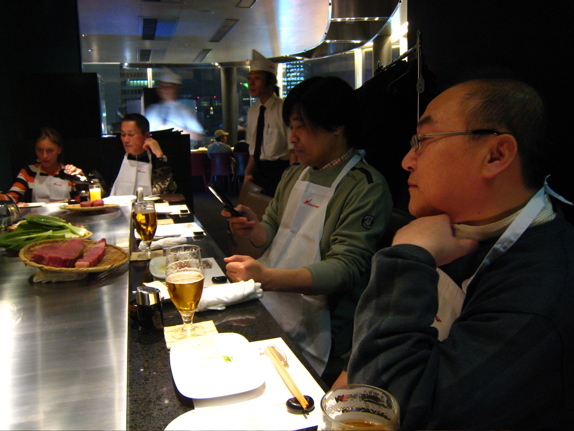 Yoh-san lives in Kobe — the birthplace of Kobe beef. I think you know where this is going. This was, to state the obvious, the most “real thing” this real thing can be. 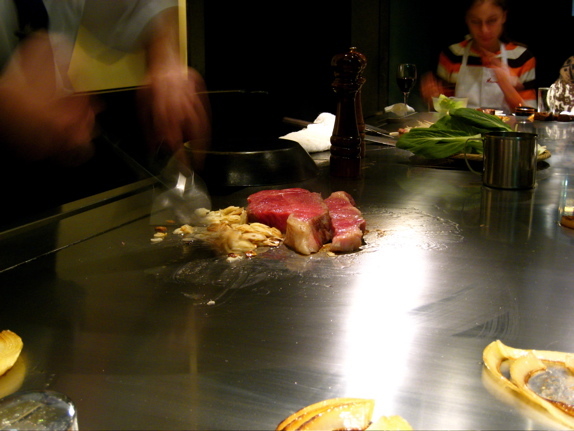 We had it not just in Kobe, but at the steak house that created what Americans know as the “Japanese Steak House” — Kobe Misano, the first Teppanyaki-style steak house. 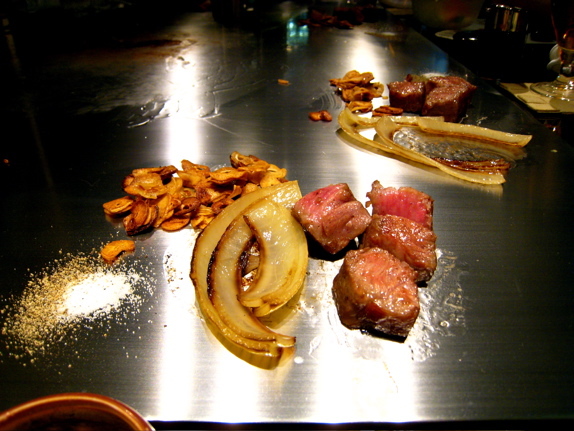 Think Benihana — but with Kobe beef, and with a mastery of cooking, rather than the mastery of flipping flaming shrimp tails into your shirt pocket. Kobe is a lovely city. 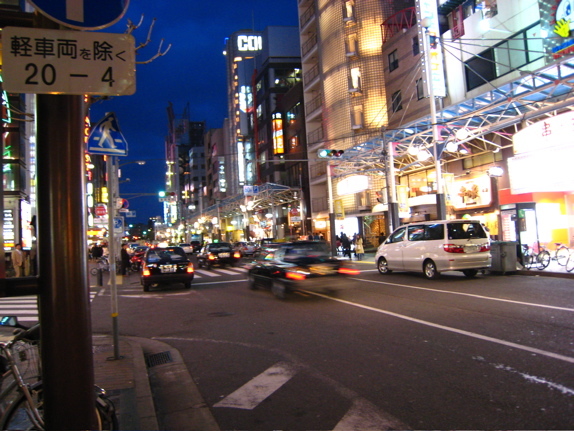 The area where the restaurant is located is bright, cheerful, bustling, and like every other part of Japan we’ve seen — immaculately clean. 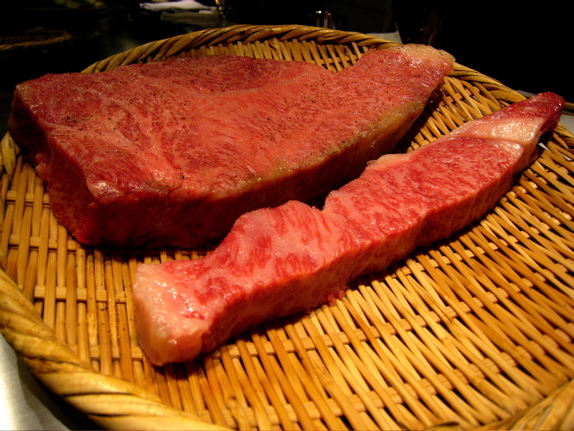 And this is Kobe beef. This is probably over a pound of it. I’ve no idea what it actually costs in Kobe — typical of Japanese tradition, Yoh-san would not let us pay, or even see the bill — but in the US, I’ve seen “Kobe” beef for $30 an ounce. This, in America, would have easily been $400 worth of steak. And worth every penny, I have to say. But that was just to look at — for now. And I wasn’t the only one who wanted to photograph the beautiful pieces of beef. Iwata-san took a picture with his camera phone. And then something I wouldn’t have expected — and would never have thought of trying had I been anywhere else : Kobe beef sashimi. 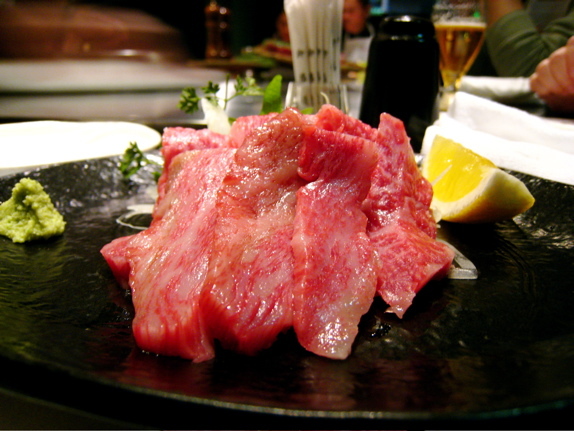 Completely raw, fresh Kobe beef, served just with wasabi and a little dish of soy sauce. This was the first chance I had to taste it. Oh. My. God. 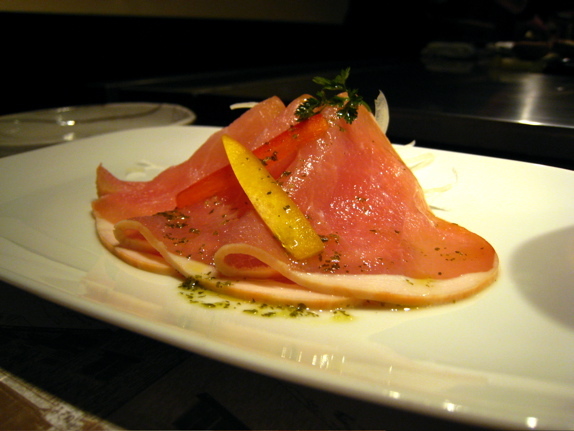 Even served sashimi-style, it melted in my mouth. You’d expect, with all of that marbling, that it would be fatty, but it didn’t “read” fatty at all. 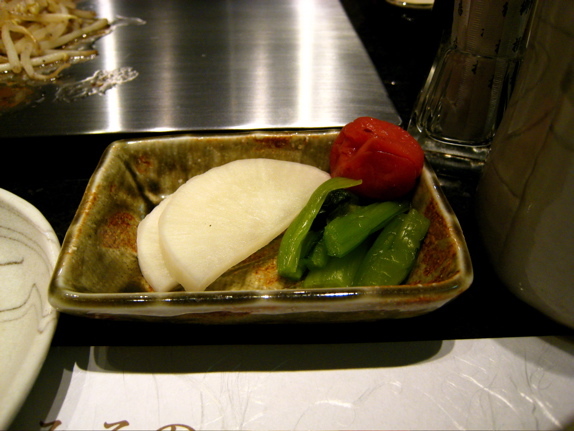 It had the texture of incredible fish sashimi. 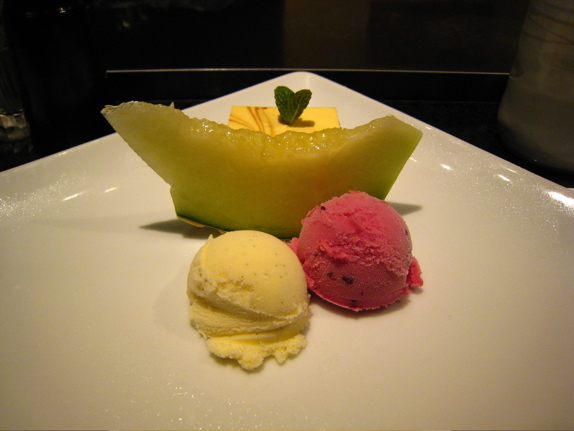 And the flavor was amazing. I loved that we were given the opportunity to experience the beef completely pure like this. Other things were cooked, of course. 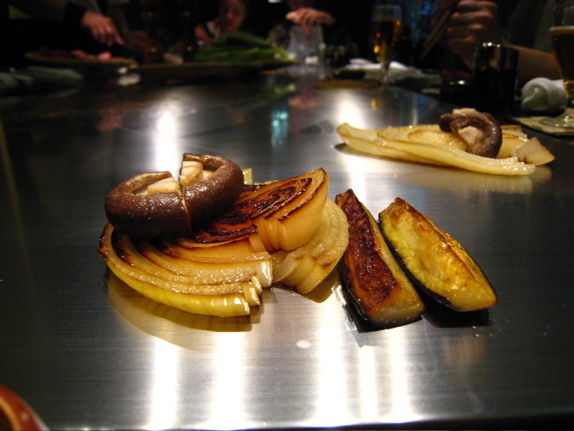 Here is the onion, mushroom, and Japanese eggplant. I have to say that it was the first time I’d had eggplant and actually liked it. Remember our lovely steaks from the beginning? 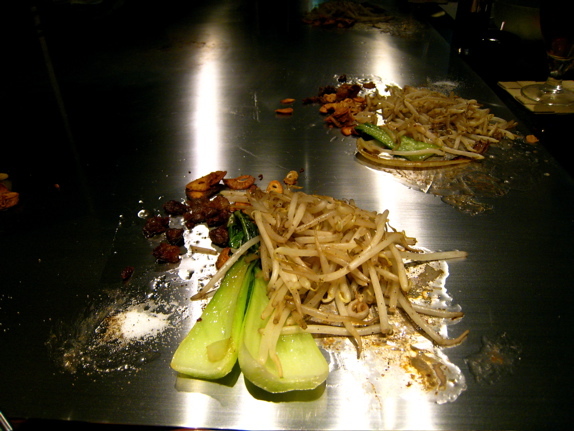 Here they are, finally cooking — just on sliced garlic. They’re cooked not in oil, but only in their own fat, rendered from the previously cooked steaks. And there was this nice, simple salad. Even the sprouts were incredible. Sprouts! Who the hell loves sprouts?! Not me, normally — but tonight, the secret was that they were cooked in Kobe beef fat. I had thought things were delicious when cooked in bacon fat, but this was worlds beyond that. I’ve honestly never had such delicious (and rich) vegetables in my life. 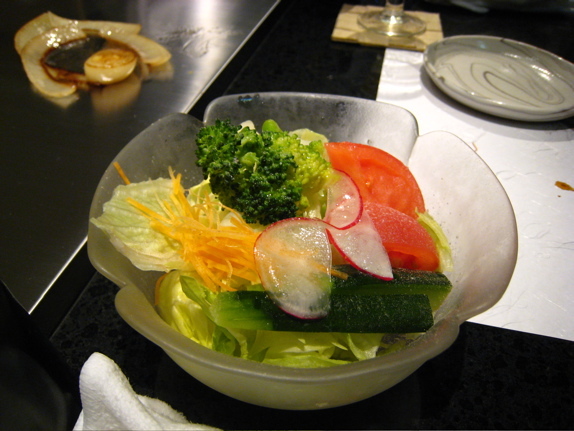 From now on, I want all of my veggies cooked in the fat of the most prized beef in the world. Also cooked in the Kobe beef fat: fried rice. 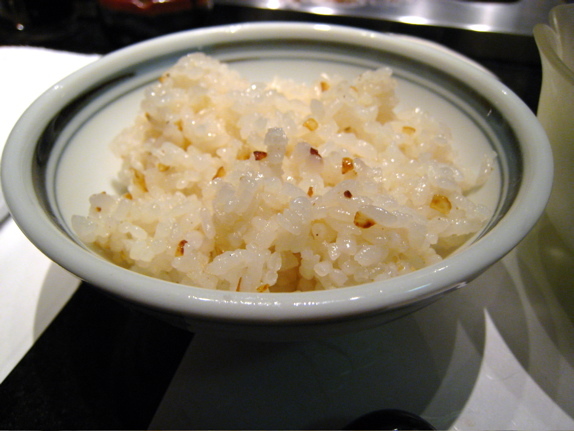 Just simple rice, garlic, and beef flavoring. Good lord, would the deliciousness ever stop?! 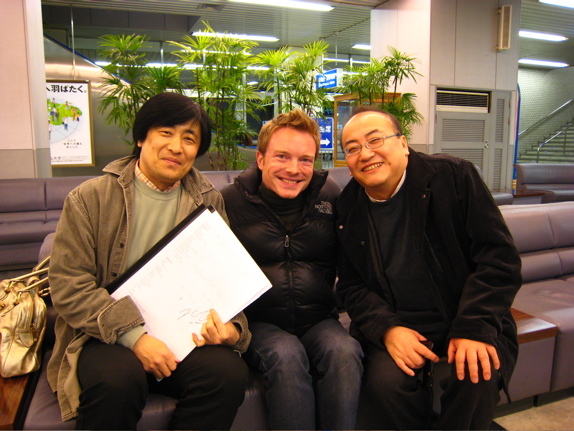 And here I am, back at the train station in Kobe, with two of the kindest people I’ve ever met — Toshiya Iwata (left — holding an autographed score of “Kingfishers Catch Fire”) and Kohtai Yoh (right). This was one of the most incredible meals of my life. 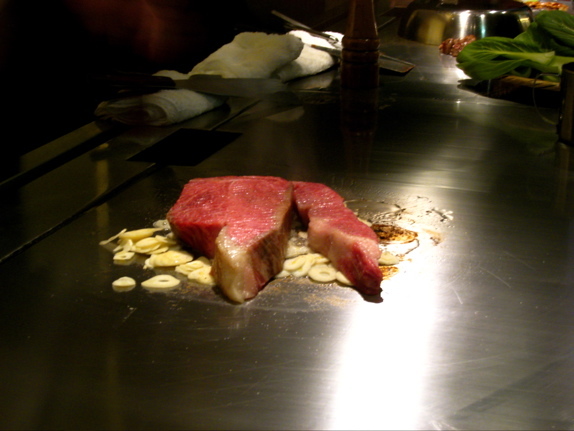 How many people have Kobe beef — in Kobe, Japan, at the steak house that invented the Japanese steak house?!?! I hate the word “blessed” and all of the baggage that goes along with it, but tonight, I sincerely felt blessed. 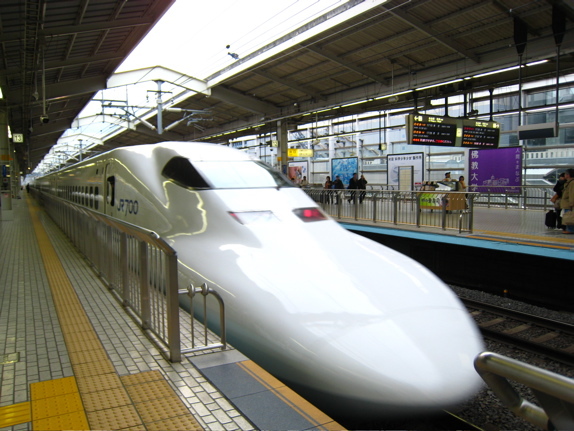 As I’ve felt every day in Japan, there aren’t words to thank Yoh-san — and everybody we’ve met — for their generosity. Japan has the loveliest people I’ve ever met. I’m glad you’re having such a lovely time in Japan! I hope the rest of your trip is just as delightful and you two come home safely.